Published by The Committee to Endow a Chair in Honor of Meyer Schapiro (1904-1996) at Columbia University. Jasper Johns is an important American artist, who was associated with an art movement that is called neo-dada. During the 1950s his art often incorporated found objects. Johns also collaborated with neo-dadaist painter Robert Rauschenberg, dance choreographer Merce Cunningham, and music composer John Cage on interdisciplinary performances. The artist introduced the subject of the target in his art beginning in the mid 1950s. 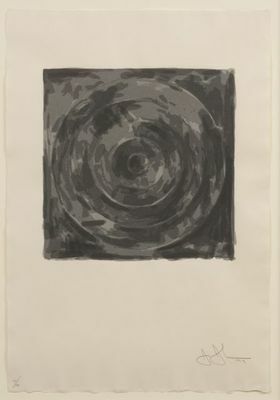 One question that may arise when looking at Johns’ image is whether to perceived it as a representation (that is, as a picture of an actual target) or as a pure abstraction consisting of overlapped circles. This artwork is from a portfolio of original prints published in recognition of Meyer Schapiro (1904-1996), a distinguished art historian who was very much appreciated by major contemporary artists of his day. In 1974, a committee was formed to establish a Chair in Art History at Columbia University in Schapiro's honor. The portfolio, published in an edition of 100, was produced to raise funds to support the Chair. UND’s set of portfolio prints are numbered 71/100.